In October the Energy Transition Lab is co-sponsoring a public forum entitled “Energy Innovation in Germany: New Business Models and Integrated Urban Redevelopment.” The forum will involve energy policy leaders from Minnesota and Germany. Join city planners U. Carstensen and J. Aengenvoort of NextKraftwerke and a group of Minnesota energy policy experts for an exciting conversation! 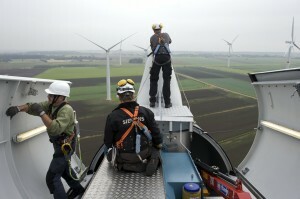 Germany’s energy transformation has entered its next stage. Large-scale decentralized renewable energy production is pushing new business models based on “virtual power plants.” IT-based company NextKraftwerke has a networked portfolio of 1,500 MW with 2,700 generation stations. It trades 6TWh. At the same time, energy efficiency mandates and renewable energy standards are shaping municipal redevelopment—in small and large settings. The $11B public-private partnership HafenCity Hamburg models one future. Are there lessons and ideas for Minnesota’s energy and urban development players? Join city planner U. Carstensen and J. Aengenvoort of NextKraftwerke and a group of Minnesota energy policy experts for an exciting conversation. University of Minnesota–Institute on the Environment, Energy Transitions Lab, UED.